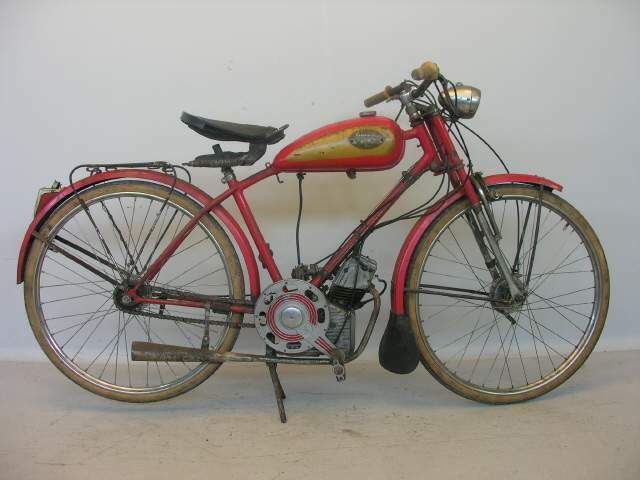 The Ducati Cucciolo was a 4-stroke clip-on engine for motorized bicycles conceived during and shortly after World War II by a Turin lawyer, Aldo Farinelli, and developed with a self-taught engineer, Aldo Leoni. 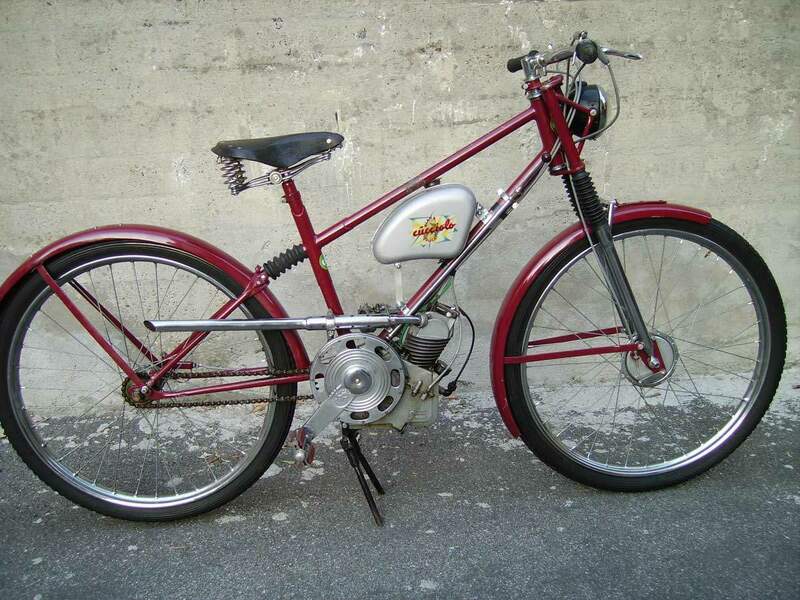 During the war, Aldo Farinelli began working with the small Turinese firm SIATA (Società Italiana per Applicazioni Tecniche Auto-Aviatorie) with the idea of developing a small engine that could be mounted on a bicycle. Farinelli's and Leone's first prototype was running on the streets of Turin in Autumn of 1944. The yapping sound of the engine's short stubby exhaust inspired the name Cucciolo ("little puppy") for the motor. Weighing a little over 17 pounds (7.7 kg) and giving 180 miles per US gallon (77 km/l) when installed in a bicycle. On July 26, barely one month after the official liberation of the country, SIATA announced their intention to sell Cucciolo engines to the public. It was the first new automotive design to appear in postwar Europe. Some businessmen bought the little engines in quantity and installed them in frames, thus offering for sale the first complete units. Soon demand outstripped the limited production capabilities, so SIATA found a manufacturing partner in Borgo Panigale, near Bologna. 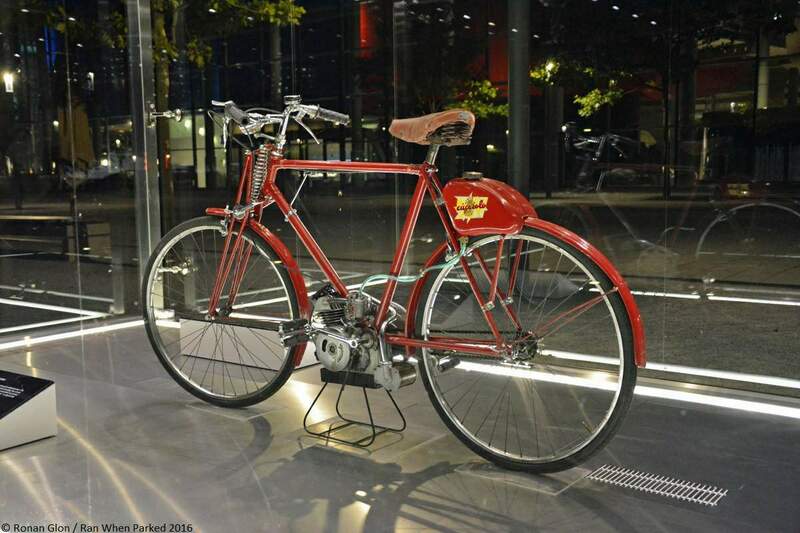 Ducati was a well-known name in electronics and appliances, and in the post-war torn Italy, it was seeking new opportunities to employ its workers and facilities, so a licensing agreement with Siata was reached. Production rose from 15 units in 1946 to over 25,000 in the following years, when Ducati reached an exclusive agreement for the production.